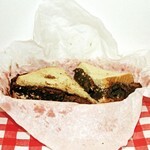 Fudge Sandwich is a collection of Segall's take on eleven songs that were originally done by other people. Equal parts reverence and reimagination, this album shows Segall inhabiting the world of a song's intent, filtering it through the muse that drove this year's exceptional Freedom's Goblin. Cluttered, passionate and inspired, the songs are barely recognizable, irresistible and by album's end, present a cohesive collection that stands proudly alongside the best of Segall's considerable output.